In common with other early broadcasters, the engineering staff at 6WF were concerned about unreliable night-time reception - with broadcast signals subject, at times, to fading and/or distortion every few minutes beyond 50-100 miles (80-180km) from the transmitter. 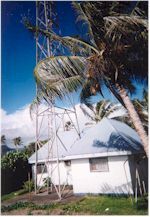 Depending on the season, prevailing conditions and transmission wavelength, such effects could limit the dependable night-time range of medium wave stations, in particular, to less than their daytime coverage. 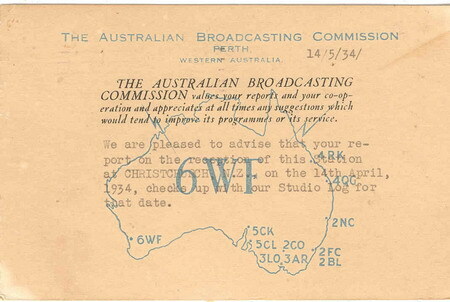 Listener confirmation card from 6WF Wanneroo in 1934. 5kW, 690kc. © Eric Shackle Collection, Radio Heritage Foundation. Keen to collect and correlate data in their own environment, Wally says that 6WF staff organised two transportable listening centres which could be set up, typically 300 yards apart, in any available level field. By way of communication, both teams were equipped with a hurricane lamp which could be turned up or down in brightness as the signal strength varied. Although primitive, the method was sufficiently effective to confirm that there was a significant time difference in the fading cycles, as observed at the two sites: when the signal was poor at one, it would often be good at the other - an observation that gave rise to the concept of diversity reception. Through 6WF, Wally C. also coodinated research into thunderstorm static. The method in this case was to distribute hundreds of typewritten word lists - statewide - to those listening to its long-wave and shortwave transmitters. At opportune times, the words would be read into the studio microphone and listeners were asked to cross out any word that was obliterated by a static crash. With a couple of hundred lists returned for analysis, it was enlightening to compare them, having respect to the listener's address. 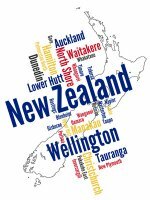 Some thunder crashes wiped out certain words state wide, indicating that they had originated in a violent storm a long way off. Others showed just as clearly the effect of localised disturbances, limited to certain areas. Intriguingly, Wally Coxon says that the same two transmitters were used (presumably in the late 1920's) to broadcast what was probably Australia's first stereo radio program. 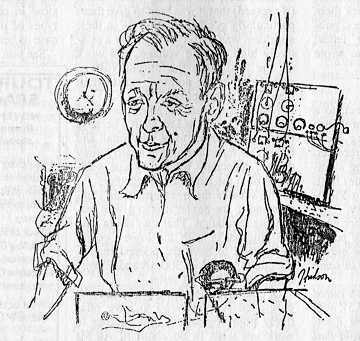 From the sketch pen of Harry Hudson, an ageing Wally Coxon is shown being interviewed at his home in Darlington, WA. Normal procedure at 6WF was to feed a common mono signal to both transmitters but, for the 'stereo' experiment, physically separate microphones were fed to the respective transmitters. Listeners with access to separate longwave and shortwave receivers were encouraged to connect them respectively to the left and right headphones. Despite the random effects on phase of the two dissimilar signal paths, Wally Coxon says that the 'spatial' nature of the two-channel sound, as heard, was clearly apparent. 6WF, he adds, also became a spontaneous training centre in the west for vocalists and instrumentalists aspiring to break into broadcasting. The development was unwittingly inspired by the visit to Perth of Raymond Ellis, an experienced broadcaster and, at the time, Chief Baritone of the British Opera Company. Entering the studio for a recital, his custom was first to remove his coat, waistcoat, collar, and tie. "If you feel all bottled up, that’s how you’ll sound over the wireless", he would say. But that was not all. During the performance, he would work within a few inches of the microphone, being meticulous about his enunciation and his control of breathing. Despite the worst fears of cautious operators, he would never bump the mic or 'puff' the diaphragm, and the sound was invariably outstanding. Such was his voice control that the operators actually had very little to do. From his example flowed regular Saturday morning tutorial sessions in the studio, in which local artists and lecturers alike honed their skills at getting the best from studio equipment of the day. To round out his story, Wally Coxon recalled some of the memofable OB's (outside broadcasts) carried out in the late 1920's. When a group of Japanese warships visited Fremantle, station management thought it would be a novel idea to do an OB from the flagship, featuring a few words from the Admiral and music from the ship's band. 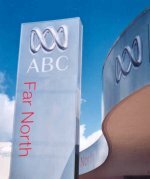 Initially, the WA District Naval Office wouldn’t have a bar of the proposal - on the grounds that an Australian broadcast station would, technically, be broadcasting from foreign 'soil'. His objections were overcome only by resort to political and diplomatic channels. This done, the arrangements were painstakingly communicated to the relevant ship's officers, and in particular to the bandmaster. What does 'on cue' mean? But, on the day, the announcers were only part way through their planned introduction when the band struck up its first item. The introduction had to be cut short, followed by a hasty reference to the band, and what remained of the first selection, then an awkward silence! Taken completely by surprise, the announcers and operators were still busily picking up the tangled threads of the broadcast when the band struck up again. What was going on? Simple: unsure about the references to 'on cue', the bandmaster had meticulously listed the provisional times and decided that the safest way was to work precisely to them. So, equippped with a podium, a baton and a table clock, he was doing his own thing - without reference to the rest of the proceedings! 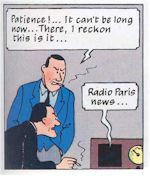 Prevented by the language barrier from ensuring a different result, the whole broadcast had to be improvised to conform to the bandmaster's list and table clock. Coverage of a different kind had to be provided for the visit to WA of the Duke and Duchess of York - later King George VI and his Queen - aboard the HMS Renown. Wally said that Dr J.B. Battye was available as the principle commentator, but as things worked out, he (Wally) found himself, at a critical moment, perched on the roof of a nearby wharf shed overlooking the scene. From his isolated vantage point, he had no option but to describe what the Duchess (the present Queen Mother) was wearing. In this department, he said, he had about the same level of expertise as the average Australian male! The epic flights of Smithy's Southern Cross provided occasions for other memorable broadcasts. 6WF was one of the stations which carried transmissions from the plane during its historic flight across the Pacific. When the Southern Cross landed at Perth after a trans-Australian flight, 6WF covered the event from a car equipped with a small transmitter feeding a signal back to the studio. To the best of Wally Coxon's knowledge, this was the first occasion in Australian wireless history when a major program feature was broadcast 'live' from a road vehicle. The same vehicle was used subsequently to provide live coverage of a road race from Beverley to Perth and, in 1927, to provide roving coverage of scenes at the Perth Royal Show. Adding to listener interest, the car carried a receiver tuned to 1250 metres such that commentators in the car and in the studio could conduct an on-air two way conversation. Early race broadcasts also provided their moments, if only because announcers like Frank Anderson had to learn how to improvise a spontaneous running commentary, given a basic interest in racing, a pair of binoculars and glances at a race book to refresh his recollection of horses, jockeys and colours. On one memorable occasion, Frank failed to notice that the wind had flipped a page during the course of a race. To make matters worse, he had also forgotten that, at the time, two horses canned the same colours. As a result, Frank inherited the distinction of calling, as the winner, a horse that wasn't even in the race! In outback lingo, a 'dogger' is someone whose job is to exterminate dingoes. From RFDS literature comes the tale of a dogger employed by the Agriculural Protection Board. Of European origin, he had access to a transceiver with a callsign which included the letter 'W' - identified phonetically as 'Whisky'. He objected, on the grounds that he didn't like the stuff. Why couldn't it be 'W for Wodka'? And subsequently, for many years in that part of WA, it was! Some announcers, according to Wally, became a little too adept at 'talking up' situations. In wrestling bouts, for instance, a display of grimaces and tangled limbs could translate into "a desperate test of endurance" - when the contestants were just as likely having an impromptu rest! Similarly a motor race with the contestants spread half-way round the track could become a "tightly contested finish". As if to make a manager's life a touch more interesting, the PMG Broadcast Station licence carried a requirement that 'no matter which is the subject of copyright may be broadcast without the permission of the owner'. While included, perhaps, as a formality, it had the ultimate effect of alerting the music industry to the possibility of making ‘a few extra quid’ out of the new radio broadcasting industry. It had long been assumed that purchase of sheet music or a disc freed the purchaser from copyright obligations for normal use. Official mention in the licence raised doubts about this simple convention, and ultimately put pressure on stations to keep a formal log of all music reproduced or performed on air. 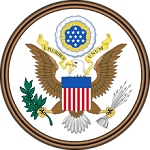 In turn, the log caused arguments about who really did own the rights (if any) to what, with some copyright agents simply submitting ambit claims repeating everything in the list. In one classic case, one copyright agent claimed for the National Anthem and a song called 'Poppies', written and performed by 6WF staff and specifically endorsed ‘unpublished’! It marked the commencent of a saga which was not resolved until much later. In 10 of the 11 weekly articles published in The Broadcaster in 1939, Wally Coxon dwells on the setting up of 6WF. The final article, however, records his personal reactions Co broadcasting in Australia over theperiod 1923-1939. 6AG's successes have fired the imagination of Westralian amateurs, and all the (licensed) transmitters are calculating inductance values and so forth, preparatory to sliding down to 40 metres. He emphasises that the choice of long-wave technology for 2FC (Sydney), 3LO (Melbourne) and 6WF (Perth) was made by local 'experts' who would appear to have been influenced by the European scene and, in particular, by the respected P.R Eckersley, Chief Engineer of the BBC. In line with their advice, the respective sponsors submitted their choice of wavelength, which the PMG's Dept formally accepted and endorsed. That, I must confess, came as news to me. The fade-free night coverage would more likely approximate the daytime figure and exceed the reliable day/night coverage of an equivalent medium-wave station. By promoting a predominantly long-wave system, the night-time airwaves in and around Australia would be less cluttered by fade-prone signals randomly reflected from the upper atmosphere. Within their own service area, the signals from a long-wave station could be enhanced by increasing transmitter power - without unduly extending 'skip' effects. The front-end performance of receivers tuned to a long-wave signal was better than for medium waves, thereby reducing the need for complex circuits - in particular resort to the superheterodyne configuration. Unfortunately, he said, while choosing a sensible wavelength, 6WF had erred in cramming the aerial system on top of the company premises in Perth. The transmitter should really have been located outside the City proper, where the aerial could have been 500-600ft (153-183m) long. Writing in 1939, Wally Coxon clearly deplores the political and commercial pressures that seduced the Australian radio scene away from the British/European example to the American pattern, with all broadcast stations crammed into the medium-wave band. 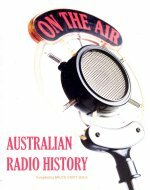 As a result, he claims, the reliable day/night coverage of the average Australian station was limited to about 30 miles (50km), and listeners were responding to the plurality of signals with American style (superhet) receivers which were too sensitive for their own good. While certainly able to log distant stations, they also reproduced the attendent noise and inter-carrier interference, meanwhile sacrificing basic sound quality for the local stations which really mattered. If Wally Coxon was conscious of 'the Golden Age' of radio in the 1930's, he makes no mention of it as such. Nor does he allow for the beneficial effect of resonant vertical transmitting antennas or the prospect of an interference-free FM service. His fervent but forlorn hope in 1939 was seemingly that the Government would wake up to itself and re-establish his beloved long wave band. For 6WF, he says, the 'new era' was ushered in on 1st September 1929, when the station was transferred by Government/PMG edict to 435 metres (690kHz). At about the same time, programming responsibility was transferred to Union Theatres Ltd (also 3. Albert & Sons and Fullers Theatres), functioning under the title of The Australian Broadcasting Company. In point of fact, back in 1929, 6WF had not been doing well financially and Westralian Farmers' management had been considering the possibility of attracting more listeners by operating their 100-metre channel as a separate station. 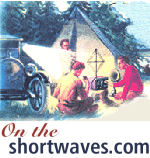 As things turned out, they didn’t have the option; but would have faced instead an obligation to re-equip and relicence 6WF as a stand-alone medium wave station. When the Australian Broadcasting Company and the PMG Dept entered the picture, the time had come for a parting of the ways, affecting both Westralian Farmers and Wally Coxon personally. Without speculating as to who said or did what, it is possible that Wally’s observations in 1939 stemmed from nostalgia for the ‘good old days’ when broadcasting was less subject to bureaucratic control. However, if Wally Coxon found himself 'at a loose end' after leaving 6WF, it wasn't for long. As mentioned in the original article, he was very soon occupied in setting up 6ML for Musgraves Ltd. 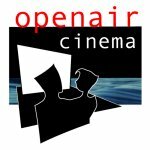 Opening on March 19, 1930, it was subsequently taken over by W.A. Broadcasters, but closed down during the early war years - a victim of wartime manpower problems. 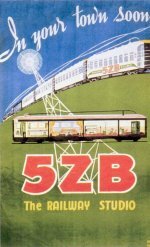 He was also involved in setting up 6BY Bunbury, but it too closed down after a couple of years - a belated casualty of the Great Depression. Then, in late 1933, Coxon was commissioned to design and build a transmitter for 6AM, to be set up in Northam, some 80-odd kilometres north-west of Perth. Backed by two brothers Frank and Archer Whitford, it was to prove no less successful than its founders' other widespread ventures - including Whitford theatre slides, the Sydney Harbour Bridge Pylon Exhibition and what was at the time one of the largest dairy farms in NSW, in the Gloucester region. Station 6AM was officially opened some six months later (June 1, 1934) with a small emergency studio in Northam, but with the main studios in Perth, connected by landline. To his obvious satisfaction Coxon, as Supervising Engineer, was able to boast that the design and manufacture of the plant had been effected in Western Australia - all except the meters and valves. Broadcasting on 306 metres (980kHz) with a 1kW licence, 6AM was at the time the most powerful commercial station in WA, offering an effective service throughout the critical area NW of Perth. In September 1934, Wally Coxon was appointed to the joint position of Supervising Engineer and Manager. As if to make Coxon feel even more 'at home', Harold R. Wells had also joined the staff of 6AM in June 1934 as its Chief Announcer. 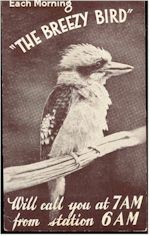 Wells had begun his career with the inauguration of 6WF in June 1924, as Western Australia’s first professional radio announcer. He had cut adrift from 6WF in 1929, ostensibly for health reasons. Significantly or otherwide, it was about the same time that Wally Coxon had 'walked' or been 'shoved', and replaced by Basil Kiiice from Sydney, the ABC’s own nominee. That Wally Coxon was still a key figure in WA broadcasting in 1939 is indicated by the editorial introduction to the series of articles which he prepared for The Broadcaster. 'Nobody is better qualified', they said, 'to write a history of broadcasting in WA from pre-1924 to the present'. One of a series of awards seeking to commemorate and promote a long standing association between licensed amateurs and the RFDS. But, despite his involvement in public broadcasting, he had another committment and for much of the relevant documentation, I am indebted to Dave Hanscomb (VK6ATE) of Quinn's Rocks, WA. 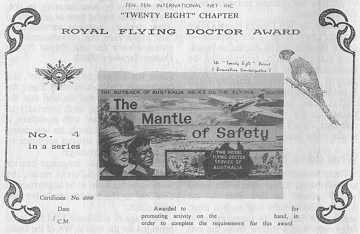 Quoting from Radio History of the Royal Flying Doctor Service of Australia 1928-1981, written by John Behr, Dave says that the Federal Council's Radio Committee met in Melbourne on November 20, 1936. Included in the initial six members was Mr WE. Coxon, Technical Adviser to the Victorian and WA Section and Mr Traeger's representative in WA. It would appear, in fact, that Wally Coxon's involvement with the RFDS dated back at least three years before this, to the formation of the Western Australian Division in Perth in October 1933. 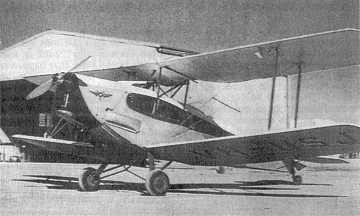 Patterned on the Cloncurry model, the Division had chartered its own DH83 De Havilland 'Fox Moth' from MacRobertson Miller Airlines, with potential cabin accommodation for a doctor, nurse and stretcher patient. This DH83 Fox Moth, VH-USJ, was chartered and later purchased in the late 1930's by the RFDS Council (WA Div), with which Wally Coxon was actively associated. About the same time, 'Mr WE.Coxon (VK6AG), of broadcast stations 6WF and 6AM' was named as Communications Consultant to the WA Group and as an associate councillor. A much later reference dated March 4, 1942 mentions that Mr W.E. Coxon 'our Technical Adviser' had been conferring with the Military Authorities in Perth regarding the transfer of the bases at Wyndham and Port Hedland, and had already been advised as to the RAAF personnel who would be allocated to those bases. Indicating an on-going involvement, John Caswell (OIC Radio, RFDS) says that archives at the Cainis Base contain an original Workshop Service Manual dated 1945-6. Compiled by WE. Coxon, it was intended for use by operators at RFDS bases and authorised regional servicemen - remaining at all times the property of the RDFS Federal Council. The unusually substantial covers on the Archive copy are of Masonite board measuring 240 x 280mm, edge-bound with black leather. Despite having been used as a workshop manual, the covers and worksheets are still in good condition. One of the original pages is rubber-stamped: Tillys Limited, Plan Printers, 728 Hay St, Perth. 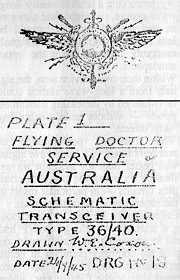 Having made a major contribution to broadcasting in WA, Wally Coxon found time in later life to draw circuits, prepare service data and supervise the construction of transceivers for the Royal Flying Doctor Service (RFDS). A contents index lists comments, circuits and layout diagrams relative to a dozen-odd models, as prepared by Aif Traeger and Walter Coxon. An example involving notes by Traeger and a circuit drawn by Coxon recommends modifications to reduce the risk of transceivers being inadvertently left 'on' in transmit mode, thereby blocking a community channel. The problem arose from children failing to replace the microphone on its switch- hook after use, while also leaving the mode switch on 'Send'. "I spent a day with Wally Coxon, Radio Advisor, at his home at Darlington, in the hills close to Perth. A radio technician of oustanding ability, he assisted Aif Traeger during the installation of the bases at Wyndham and Alice Springs. At the time of my visit, he was completing the equipment for the new Base at Carnarvon." "At the end of the war Traeger, overwhelmed by orders for transceivers which he was unable to fulfill, gave Coxon permission to build sets in Western Australia. With the help of spare-time workers, sets were assembled from parts bouglu in or made by local mechanics." "Later, he built his own set 'The Coxon Communicator', used at many outposts in the State. It is inexpensive and operates efficiently over the Base frequency." How very inappropriate was my earlier remark about an anti-climax! If Wally Coxon wanted to apply to good purpose a lifetime of communication skills, humble or otherwise, what more worthy cause could he have chosen to support than the vision of Rev John Flynn: 'To spread a mantle of safety over the people of the vast inland of Australia, combining the use of aviation, medicine and radio'? Dave Hanscomb, mentioned earlier, is confident that a detailed search through relevant literature would cast still more light on the career of Wally Coxon. But for the present, we have probably said enough. The ultimate comment in Dave's letter is "I didn't actually meet Wally, as he became SK (Silent Key) in mid 1968. (Amateur Radio list, changes for callsigns for October, 1968. See also Amateur Radio for April 1969. VK6AG WE. Coxon — deceased". 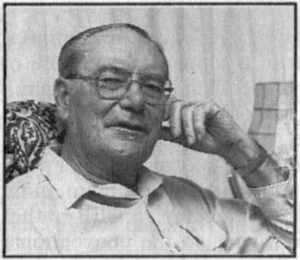 This feature was written by Neville Williams and originally appeared in the May 1994 edition (Volume 56, No.5) of Electronics Australia as part of their "When I Think Back..." series under the title "More About Wally Coxon and the first broadcast station in the West - 2". This digital version was produced by the Radio Heritage Foundation. "There was this mountain village in Russia where my music was getting in on some German station. I remember this because music used to get up to Saskatchewan from Texas, late at night after the local station closed down."